Technology continues to exert a dramatic impact on our economy; iPads, wireless internet, virtual offices are all changing the manner in which we work. It’s now a reality that over 30 million Americans conduct some business from their home. That ability to shift the paradigm of the typical workday so as to not have to physically drive miles thru traffic-choked freeways to sit at a desk, is enhanced and accommodated by having a legitimate workspace in your home. Some workspaces are merely a bedroom in the house that is no longer needed-the maid’s room that the children outgrew, or a teenager who has moved on to college. Increasingly though, home owners, especially here in Los Angeles which has a lot of self-employed and creative artists, home offices are custom tailored spaces that enable the owner(s) to conduct client meetings or utilize uniquely specific functions such as Home Recording studio for a musician/composer, Dance studio, video & sound editing bays, or special effects studios that accommodate multiple computer work stations. Another huge benefit is if the Home Office is an additional detached structure. This enables the owner to maintain the advantage of separating their personal life from their workspace, even if only by a physical distance of ten feet. It can create that important psychological divide. It can also serve as an occasional Guest House for the overnight guest or out-of-town relative visiting for the holidays. There is meaningful increase in value, aside from just the price per square footage to a Home Office. The housing market accords a huge financial benefit to properties that have legitimate home office spaces or structures. Not only do these homes command higher prices than their comparable peers, but sometimes they represent the only type of property a certain buyer will even consider. 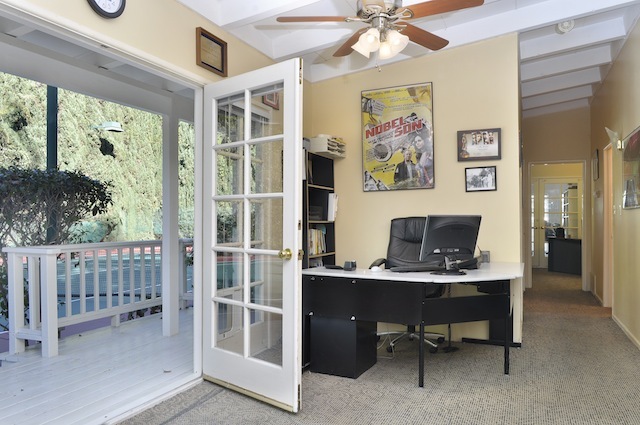 The property at 16144 High Valley Place in Encino served a prominent attorney who custom built his home office to have a separate entrance leading into a full-fledged reception area, complete with a front desk for a secretary. Behind floor-to-ceiling smoke glass doors, the CEO-like desk beckoned clients into an impressively comfortable and cavernous suite, complete with a den and fireplace, bookshelves housing thousands of legal journals, and a view of the owner’s backyard tennis court. He was able to claim a hefty home office tax deduction, save on fuel and exorbitant downtown parking fees, and always be on time for family dinners. The current seller of 3950 Vantage in Studio City tired of commuting from his West Valley home to his video production studio in Hollywood, so when this lovely home with a detached 1,500 sq. ft.3-room office became available, he knew he could move his entire editorial staff into the structure, and be able to walk 10 steps to his work. When you are looking to buy a home, consider how a home office can enhance your lifestyle and provide a big economic plus at the same time.